The Ridgidrain ADS system is the complete technical and commercial answer to all non pressure, surface and sub-surface water drainage applications. To date Ridgidrain pipes have been installed on thousands of civil engineering projects including highways, railways, airports, industrial infrastructure, environmental and leisure projects as a direct alternative to concrete and clayware pipes. Ridgidrain ADS is supported by a large range of fittings and bespoke fabrications can be manufactured to customer specifications. A high quality, light, easy to handle and install alternative to heavy concrete and clay gullies. Ridgigully is manufactured in durable HDPE in 3 sizes. Ridgigully is suitable for both trapped and untrapped systems with 160mm spigot outlet as standard, which is easily adapted to Ridgidrain, Polysewer and other pipe systems. A range of accessories is available, including gully risers that key into the gully and eliminate the need for brickwork to finished level. Ideal for flexible gully connections, 150mm single wall corrugated Ridgiflex has the same external profile as a Polypipe Ridgidrain. 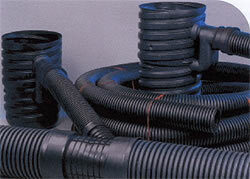 Available in 25m coils, it is fully compatible with standard Ridgidrain fittings. Manufactured to meet the reuirements of the Highways Agency, Type 6 Fin Drain and Type 8 Narrow Filter are BBA certified for surface and sub-surface water drainage applications. Fabrications can be made to precise customer specifications with standard products also available for road and rail applications. 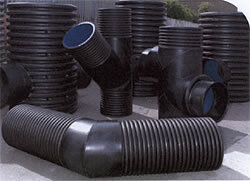 Ridgidrain catchpits are supplied with inlets and outlets fabricated to customer specification. One piece units can be supplied complete with step irons to BS1247 and can be benched with concrete in the traditional way. Catchpits and manholes can be supplied with intergral base of plain ended. A range of catchpits are manufactured for railway track and highway filter drainage. 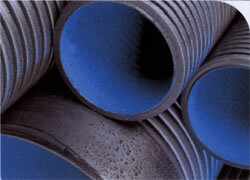 Available as straight connections or adaptors for a wide range of pipe materials and sizes. Robust EDPM flexible rubber couplings manufactured from EPDM to BSEN681-1, ideal for jointing pipes for sewerage, drainage and other low pressure applications. A full range of adaptors is available for sealed connections to other systems.